VATICAN CITY (CNS) — The Vatican approved new statutes and bylaws for the U.S. Leadership Conference of Women Religious, ending a seven-year process of investigating the group and engaging in dialogue with its officers to ensure greater harmony with church teaching. 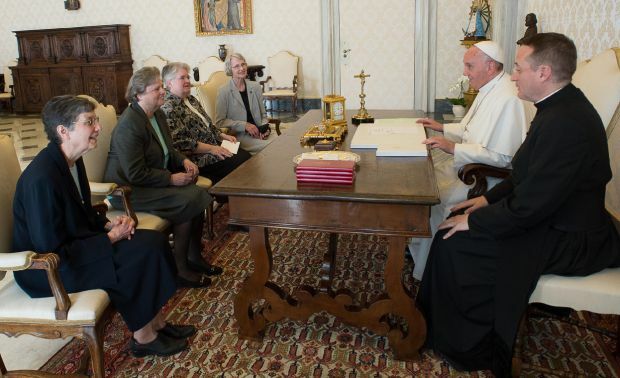 “From the beginning, our extensive conversations were marked by a spirit of prayer, love for the church, mutual respect and cooperation,” said a joint statement of the LCWR officers and the U.S. bishops appointed by the Congregation for the Doctrine of the Faith to oversee the conference’s reform. LCWR promised that materials it publishes first will be reviewed to “ensure theological accuracy and help avoid statements that are ambiguous with regard to church doctrine or could be read as contrary to it.” In addition, programs sponsored by the conference and speakers chosen for its events will be expected to reflect church teaching, the statement said. After asking Archbishop Leonard P. Blair of Hartford, Conn., in 2008 to carry out the doctrinal assessment of LCWR, in April 2012 the Congregation for the Doctrine of the Faith called for the revision of LCWR’s statutes and bylaws. The reform, the Vatican said, was meant to ensure the conference’s fidelity to Catholic teaching in areas including abortion, euthanasia, women’s ordination and homosexuality. The organization’s canonical status is granted by the Vatican. Releasing the assessment, the Vatican had appointed Archbishop J. Peter Sartain of Seattle to provide “review, guidance and approval, where necessary, of the work” of the conference and its reform efforts. Archbishop Blair and Bishop Thomas J. Paprocki of Springfield, Illinois, were named to assist him. “We do not recognize ourselves in the doctrinal assessment of the conference and realize that, despite that fact, our attempts to clarify misperceptions have led to deeper misunderstandings,” the officers said.